This porch? It was still a Christmas porch until just a couple of days ago. 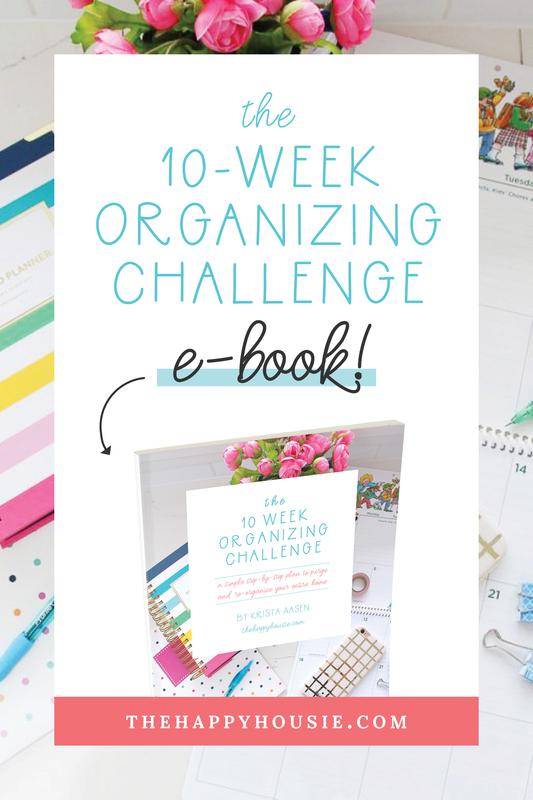 With the organizing challenge happening, some jobs have slipped between the cracks. Such as the front porch decor. And the garage. But that’s another story altogether. Anyhow… I thought spring was on the way this week. We’ve had some beautiful sunny days that are so warm that the kids are playing outside in their t-shirts. I still wore my coat, but they don’t seem to mind the crisp spring air quite as much! It fooled me. I figured spring was right around the corner. Until we woke up with a light dusting of snow and frosted over cars this morning. This was so easy to pull together that it makes me wonder what took me so long? It seriously took me about half an hour to take the Christmas Porch decor down and put up some spring decor. Do you ever put off little jobs like that only to be reminded how quick they can be?? 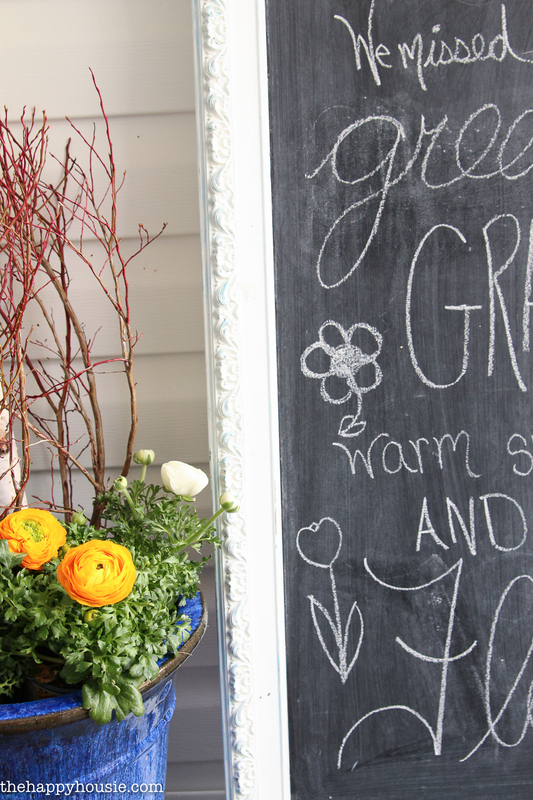 All I did was grab some pretty little spring flowers from the grocery store, plunk them into my pots or group them together on the ground, redo my seasonal chalkboard, add some colourful outdoor pillows, and finish it all off by throwing up a fresh and colourful spring wreath. 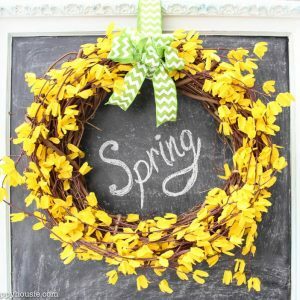 I love my five minute dollar store early spring forsythia wreath from last spring… but if you are looking for a wreath and don’t have time to DIY one, then I have some ideas for you at the end of this post! Cleaning off the old porch did make me realize that we have some maintenance to tackle as soon as the weather warms up. Our concrete paint is starting to chip and peel. It never seems to last very well. I’m looking into a more long term solution for our porch instead of the paint… Let me know if you have any ideas! This giant chalkboard that I made out of an old oil painting from a thrift store is still one of my faves. I love changing it out each season! 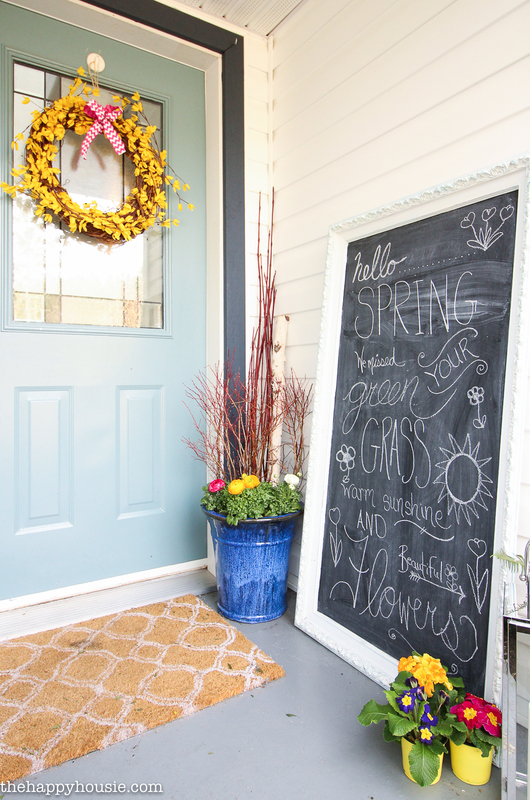 A few flowers and a pretty spring wreath makes such a big difference,right? I’ve got some DIY wreath ideas for you!! 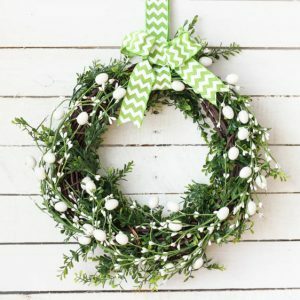 Or if you are you looking for a wreath for this season but don’t want to DIY it, I’ve picked out some great ones for you! Love it! Since you started the confessions. I still have a couple of Santa’s in my office. I just can’t part with them! I love your new spring porch. 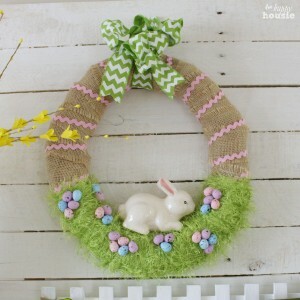 This is a great collection of wreaths. You’ve inspired. Come over every week and join the party. 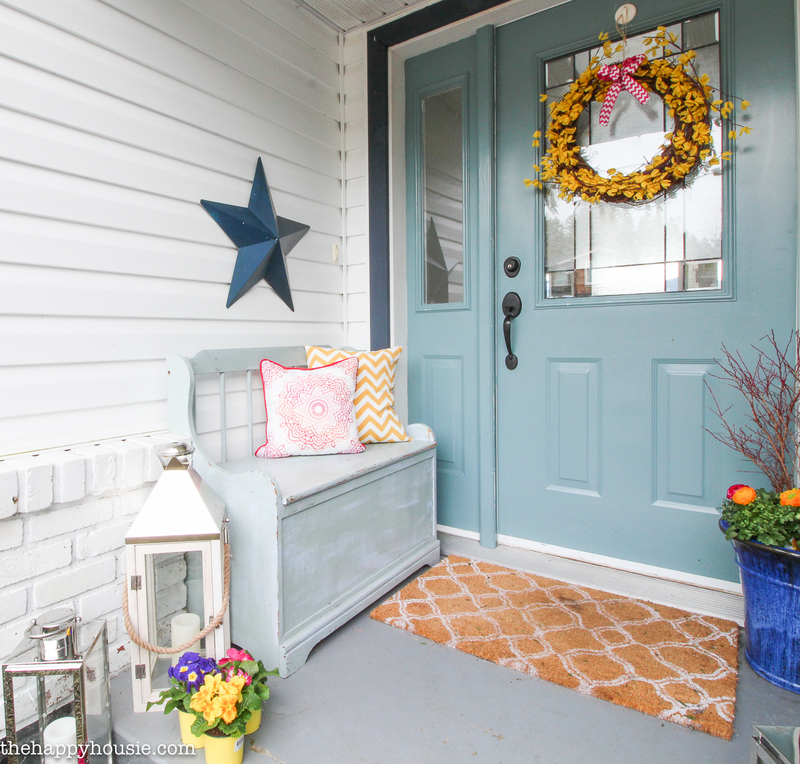 Your porch is definitely all about Spring and I can’t wait for it to be here! Beautiful! 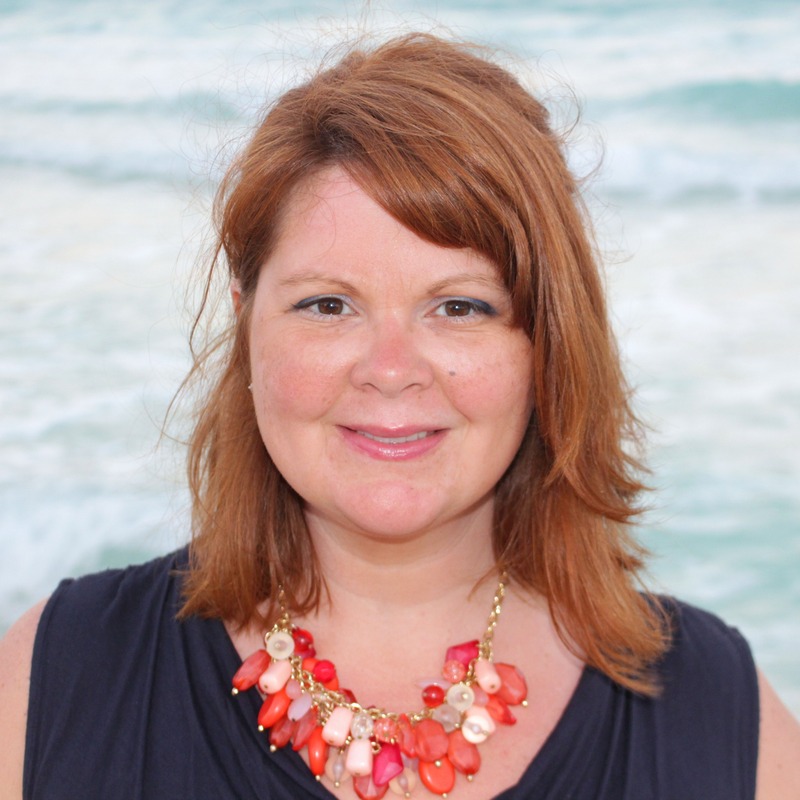 Thanks for sharing it with us at Funtastic Friday! Wow, what a nice front porch. Love the Idea of the chalkboard. My front porch is still filled with snow!!! :’-( Can’t wait for spring and your post just gave me hope!!! Came from PINWORTHY PROJECTS PARTY, and your project is going on my board for sure! 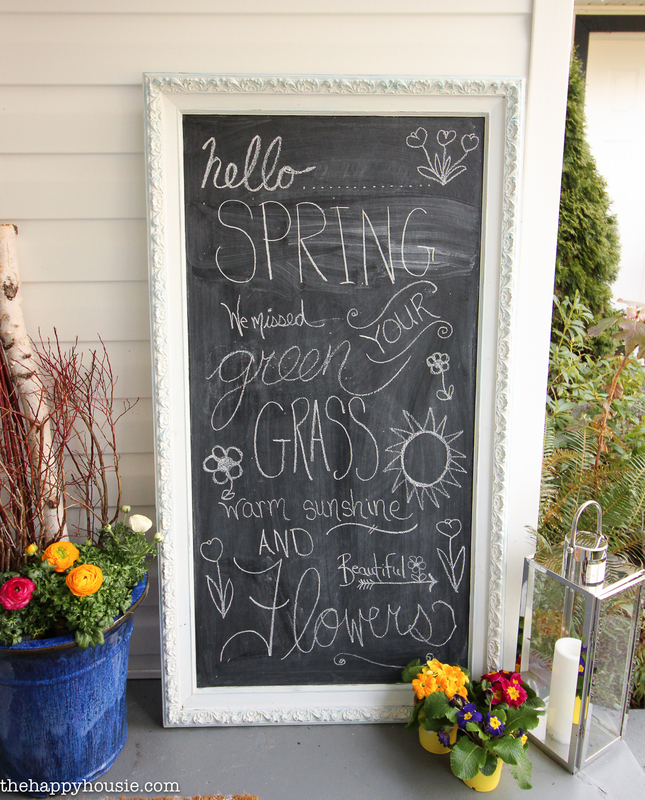 I like the big chalkboard sign on the porch! Super cute. Sharing On G+ Thank you for sharing on Merry Monday! Have a great week! 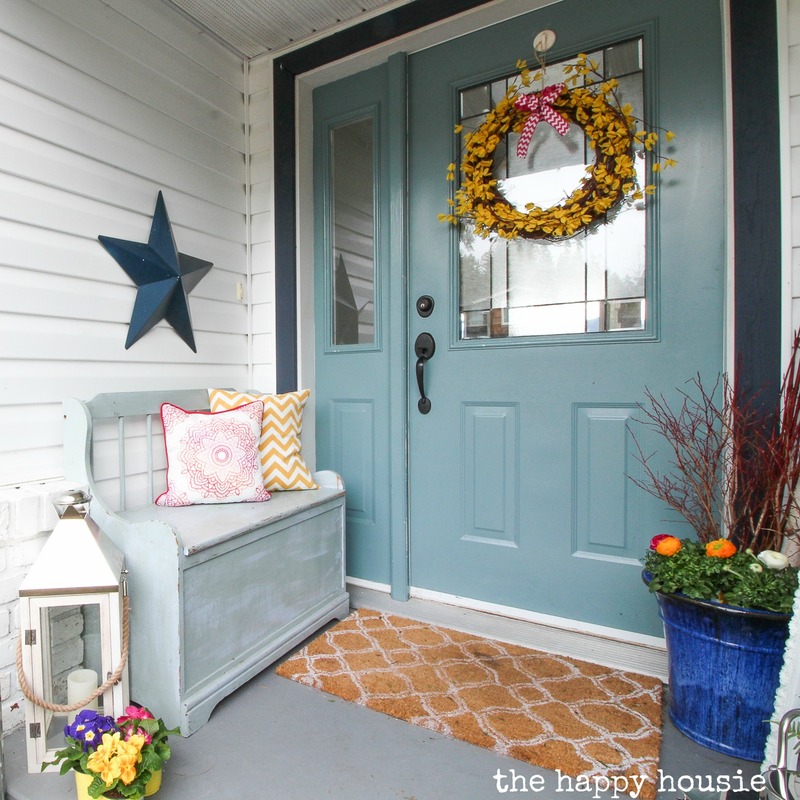 Love your front porch for spring! I especially like the forsythia in the wreath and also the tall, vertical arrangement in the planter. Very nice! 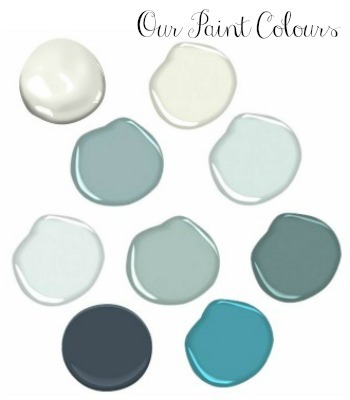 I think everyone is ready for spring and really want the pops of colour! 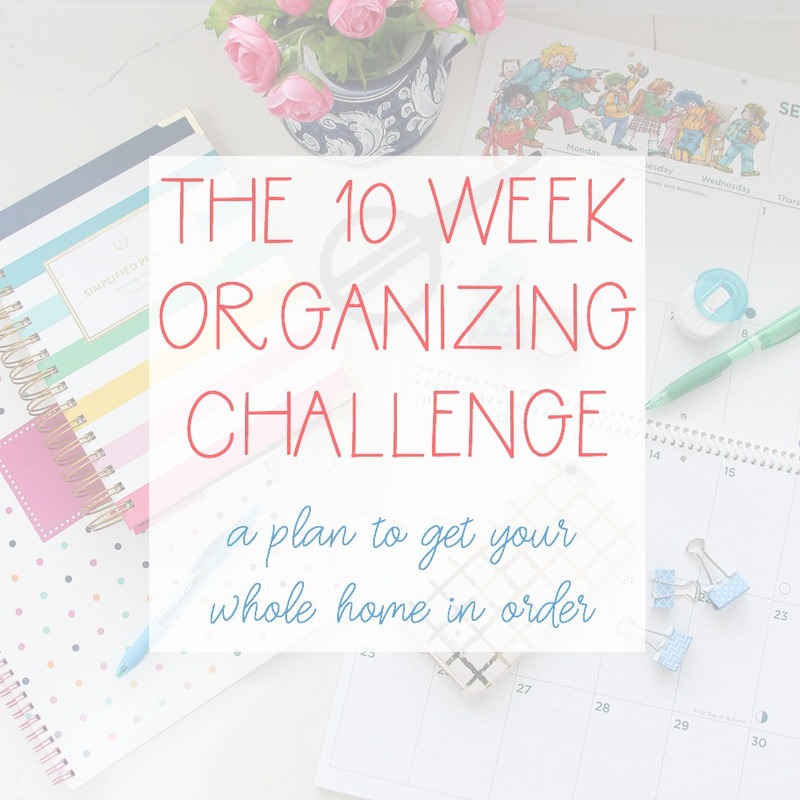 Yes, I totally can relate to your statement on “putting off little jobs” – when I finally got around to cleaning and purging our mug cupboard and junk drawer (that I put off way too long) it only took 15 minutes each!?!?! When you find a solution for your front step (concrete paint) – please share! I too need ideas to fix up our front porch floor. Love the door. What color did you use? 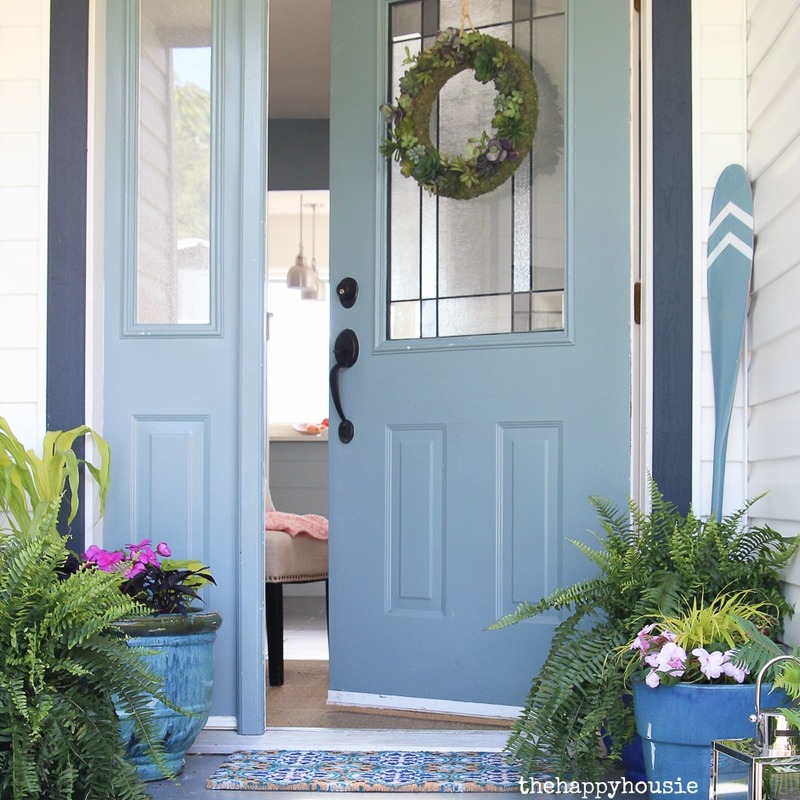 This inspires me to start looking for ways to spice up my front door! 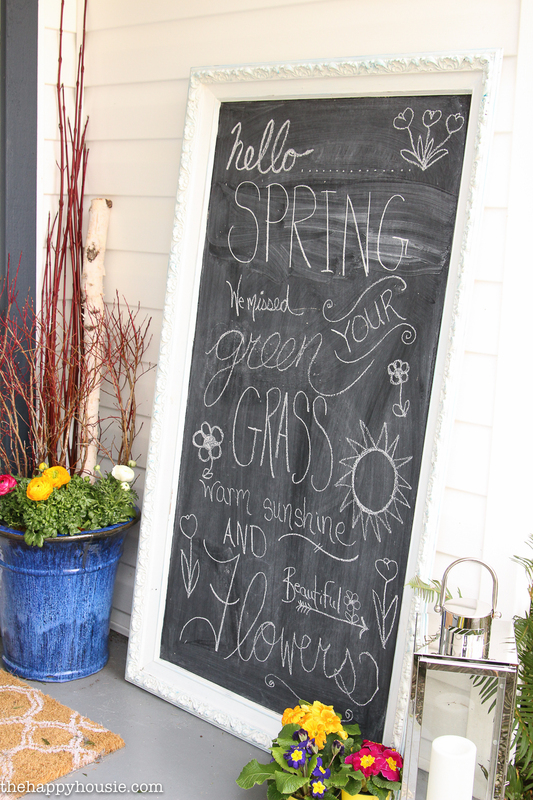 Love the chalk board idea outside, never seen that before (fyi, you missed the p in spring). Now if only it would stop snowing here! Oh my!! I can’t believe I didn’t see that until you pointed it out! Lol – I guess I’ll be fixing that tomorrow and taking some new pictures. Oops! 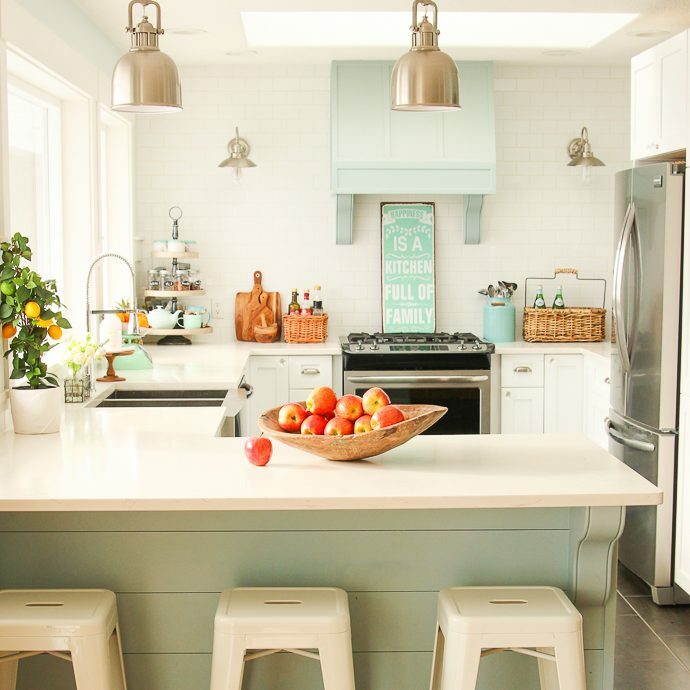 I love that chalkboard next to the door! That seems like a brilliant idea! Krista, I luv that UBER CHALKBOARD FRAME!!!! BEAUTIFUL porch!